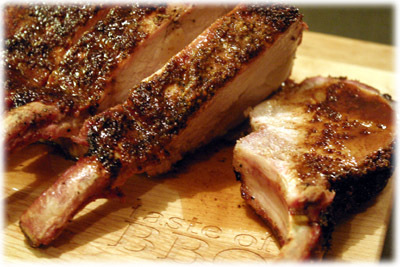 because this pork roast recipe has rib bones it stays juicy all the way to the dining room table. The picture above was taken about 10 minutes after I removed the pork roast from the Big Green Egg. You can use any type of barbecue or grill as long as it has a cover. 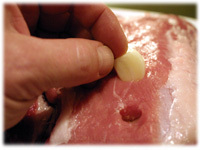 You can see part of a garlic clove that's been stuffed into the pork roast before cooking. You can also see how juicy the meat is. 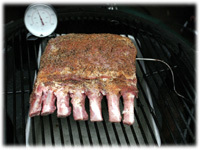 There's no such thing as a specific pork roast cooking time, you should always monitor the internal temperature. 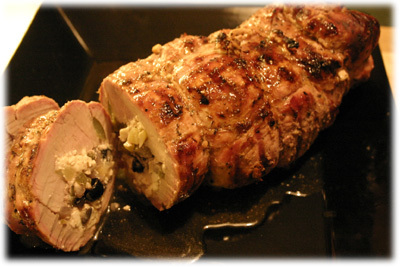 While some pork dishes can now be cooked to 145F I recommend cooking this pork roast until you have an internal temperature of 155F on the grill. Note: for best results let the roast sit 4 hours in the dry rub before cooking. 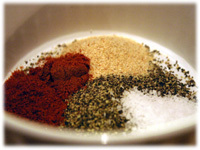 Prepare the dry rub by combining the ingredients listed above in a small glass bowl. Set aside. 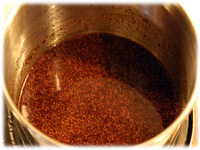 In a medium sauce pan combine the pork basting sauce ingredients listed above and bring to a gentle boil. Let simmer several minutes then remove from the heat and set aside. 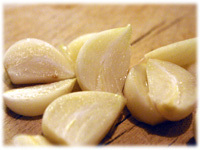 Slice the 6 cloves of garlic in half to make 12 slivers. 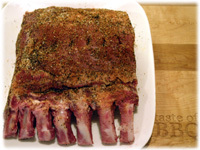 Lay the pork rib roast on a cutting board and insert a sharp knife into the top of the meat between the rib bones across the width of the roast. Don't insert the knife all the way through the roast - just half way into the middle. 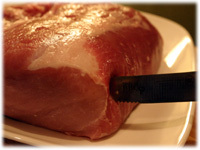 Continue to insert the knife into the pork roast along the large back side. Insert a sliver of garlic into each hole you made with your knife. Push the garlic into the meat far enough so you no longer see the garlic clove. 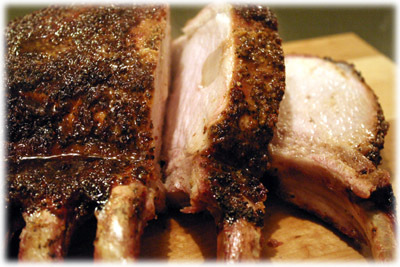 With your hands rub the pork dry rub all over the roast. Set up your barbecue or grill for indirect cooking and preheat to 325F - 350F. Place a disposable aluminum pan filled with water under the grate and place the roast on the grate over the pan of water. 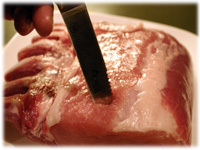 Insert a cooking thermometer or remote thermometer sensor into the thickest part of the meat so the tip of the probe is in the center of the roast but not touching a bone. Close the lid of the BBQ. When the internal temperature reaches 130F - 135F begin basting the roast with the bbq pork basting sauce made earlier and continue basting until the internal temperature reaches 155F. Slice the roast between the rib bones, drizzle any remaining basting sauce over the slices and serve.